Let's Listen - ATOM by Audio Modern! First, SORRY THE AUDIO IS SO LOW :) oh and 4:33 is what happens when you switch a preset without purging or stopping the current one from ringing out, oops ! Hey guys! 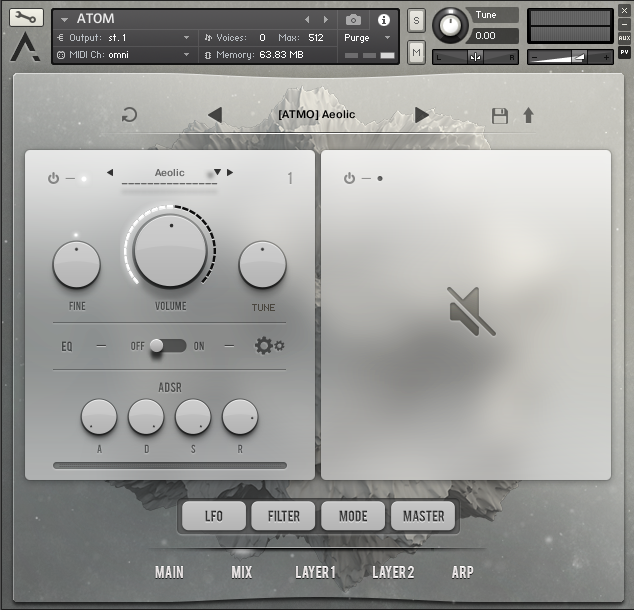 Another review here of an impressive sound design library from Audio Modern, ATOM! Be sure to check out the audio demo at the bottom of the page! Once again, this is a library I got for a great discount from the wonderful VSTBuzz. I swear they have been on fire lately. So let's dive right in, shall we? ATOM is touted as an "Advanced Film & Game Sound Design Tool". I wasn't sure if I really needed something like that, but then I listened to the demos, and was thoroughly impressed. This library is loaded with atmospheres, effects, keys, sequences, and it actually goes beyond what I would initially consider "sound design". This is an impressive melodic instrument all on it's own. The interface is quite impressive. Simple and clean and quite visually appealing. This is a Kontakt library and loads up in the browser section opposed to adding the library with a serial through Native Access, which is always a small annoyance of mine (the browser section always seems to take a bit longer to load, even when from an SSD), but when something sounds this good, I'll let it slide. As you can see here, we've got a patch browser up top, and two panels in the middle where we can load two seperate layers of the various sound sources available. Most of the presets consist of two layers here. The sounds are divided into the following categories: Atmospheres, Keys, FX, Percussion, Sequences, and Synths. Atmospheres make up the biggest chunk of the 180+ presets, and are quite stunning to behold. The atmosphere presets in ATOM are incredibly evocative and constantly shift and evolve as you hold the note. Some are best used with one key, as they have subtle harmonies or pitch shift effects that add to the mood, building tension or conveying a soft sense of calm and beauty. Others are best when playing chords, giving a dreamy pad effect. The first preset which is pictured above, Aeotic, has a white noise type effect in the background, and really gives off the sense of being alone in a quiet field blanketed with snow, or as someone else pointed out to me, the calming winds of laying on a beach. The sounds on display with every atmosphere preset really are top notch and incredibly unique. Each sound has an immense sense of space and are a joy to behold. You truly never know what you will find when you are scrolling through the patches in ATOM, but I can guarantee it will be unique and impressive. The FX patches will be right at home in any kind of score, especially a film trailer. Some are intense and gritty, others screeching and quite disturbing, yet every tone sounds audibly pleasing somehow, not harsh to the ears, and each is infinitely usable. There are standard impact hits, rises, transitions, glitch FX, and then more unique sounds like computerized electronics and warped, percussive metallic sounds. The keys section is full of atmospheric keys (surprise!) and again, the processing and initial design of each sound is impeccable. Each sound has multiple layers on display, with audible harmonics and subtle touches. The keys can cover everything from slamming distorted piano hits, smooth guitars, plucked string instruments, and soft and dreamy vibes reminding me of an electronic piano or a Yamaha DX-7. My favorite section besides the Atmospheres are the Sequences. Some are meant to be played as arpeggios and provide soft guitar plucks, glassy piano sounds, stuttering vocal effects, and subtle chiming, able to be played as any chord and add instant rhythm to a track. Some of these are really nice as soft underscores to an ambient track. The synth section is impressive for a Kontakt library that is labeled as a sound design tool, as some of these can truly stand on their own for both composers and producers alike, however it is the smallest section of the library. There are only a couple things that were slightly annoying with this library, one being the fact that it's preset bank is quite annoying to navigate, as every single preset is listed in one long list, instead of dividing them up into the separate sections I mentioned above. This seems like an oversight and you have to scroll through a very large list to find a new one, as it always starts from the top. However, this is a minor complaint, but worth mentioning. Overall, ATOM is incredible and I have used it on multiple projects since purchasing it a couple weeks ago. I can easily see this becoming a staple in my compositions, as it offers something incredibly unique and cutting edge, yet still sounding natural. I love it and it comes highly recommended from me. My favorite purchase this month by far. ATOM retails for 149 Euros, which is approximately 184 USD.